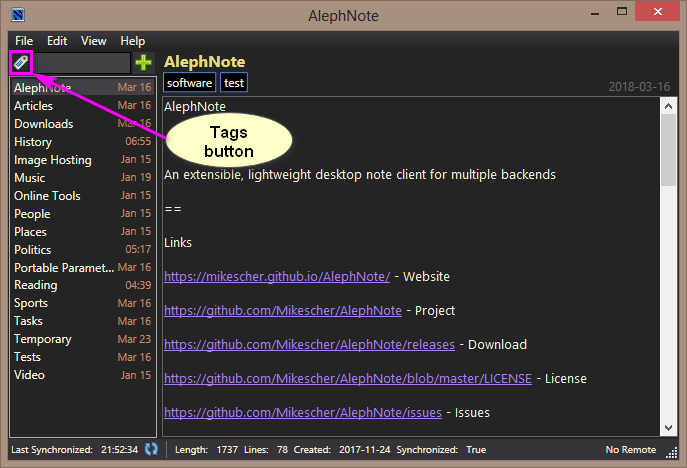 ResophNotes (database entry, forum thread) seems to be abandoned (more than 4 years since the last release) and AlephNote comes as a viable alternative- the program is in active development and seems to be stable. 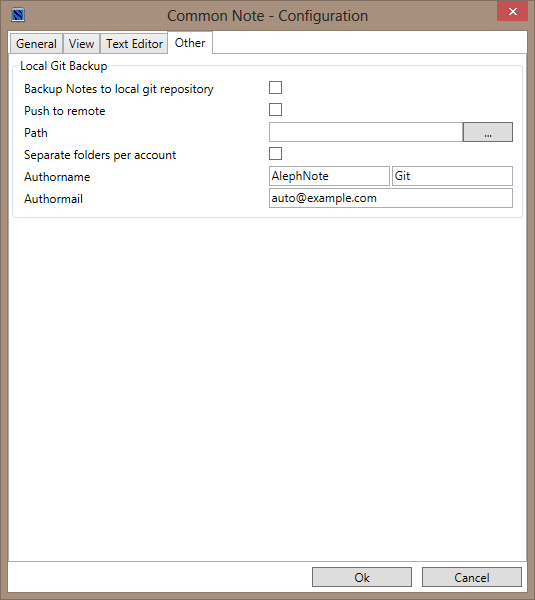 AlephNote is portable by design- settings are saved in noteapp.config file inside program folder, notes are saved .notes sub-folder inside program folder. 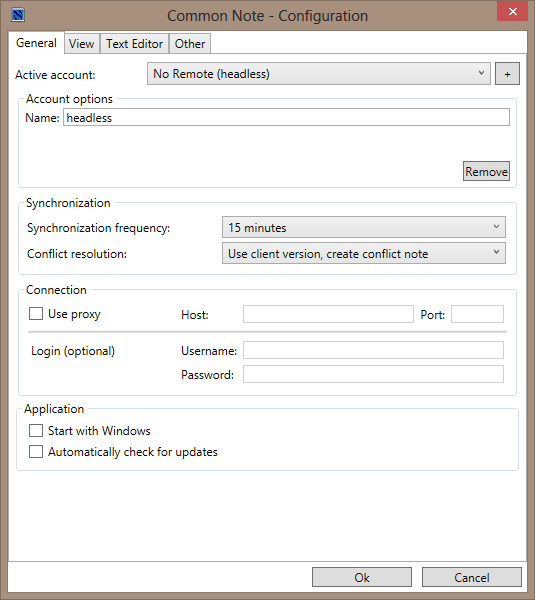 By strict definition, like every .NET program, AlephNote is not stealth- AlephNote.exe.log file is created in AppData (C:\Users\UserName\AppData\Local\Microsoft\CLR_v4.0_32\UsageLogs\AlephNote.exe.log). 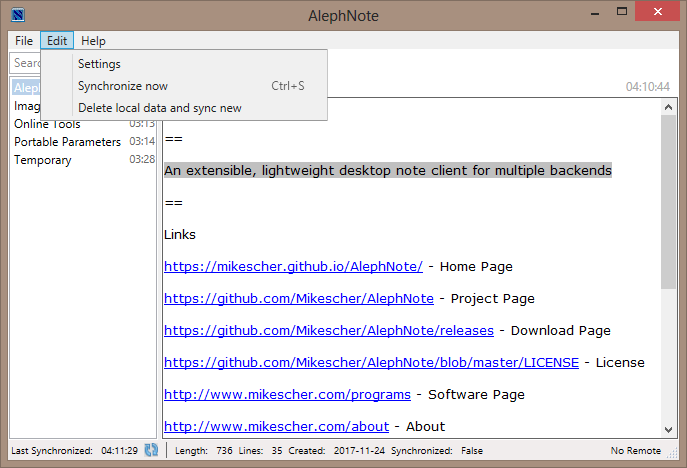 AlephNote requires .NET 4 and runs under Windows 7, 8, 10. 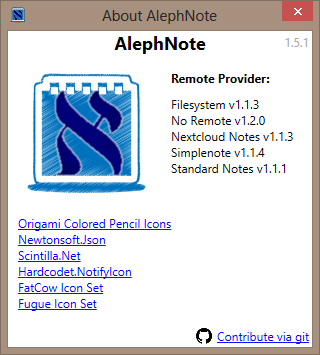 AlephNote is licensed under MIT License. The developer, Mike Schwörer, is very helpful and open to suggestions. 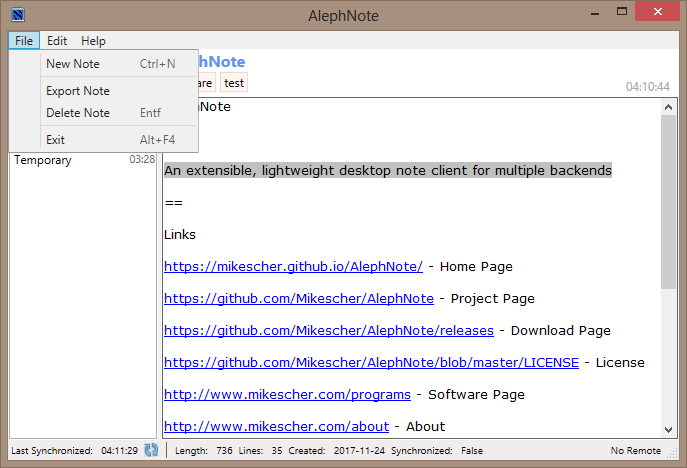 I have decided to retire from this site because of the creeping censorship but I made an exception to review AlephNote- the program is promising but unknown and the developer is friendly. 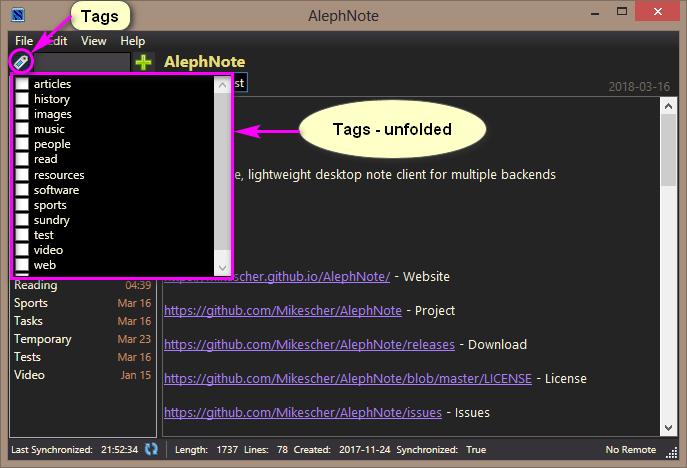 I believe that AlephNote needs some publicity and that it may be useful for the community. Care to provide supporting evidence for this most bewildering statement ? This is perfect -- I've been using Resophnotes for years now and it's great to find an alternative that's both active and open source. Thanks for that. I've spoken with him separately on this. He felt that de-linking to the Opera source code download amounted to censorship. My rationale behind this move is here. Note that we are still linking to the 4chan homepage. I'm of course sad to see Smaragdus go, but he's done some amazing things for this site and I appreciate his work to this point. Whatever project he moves on to will be lucky to have him. Last edited by webfork on Fri Nov 24, 2017 10:47 am, edited 2 times in total. For the record, I definitely don't count removing links to illegal stuff as censorship. Very sorry to see you go smaragdus. SYSTEM wrote: ...For the record, I definitely don't count removing links to illegal stuff as censorship. Agreed. I'm really digging the program so far. xor wrote: I'm very convinced in my mind that whatever it is, it's not worth the awesomeness of Smaragdus deeds in TPFC. I came out against the linking because hosting illegal programs or illegal code will in the long run hit our search engine rankings -- something that we've maintained pretty well over the years with little effort. That said, I'd certainly make an exception in this case but ultimately this is Andrew's site and his call. Also, smaragdus is one of the few people I've been lucky enough to get to know personally via my work on this site. I think he had his eyes on some other projects and I wish him well. Maybe predictably I've come back to this program and I'm really liking it. 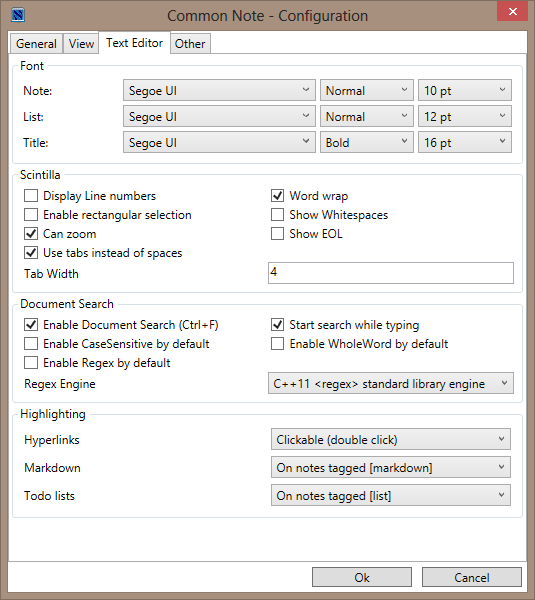 There's a lot of functionality as a tabbed notepad program. 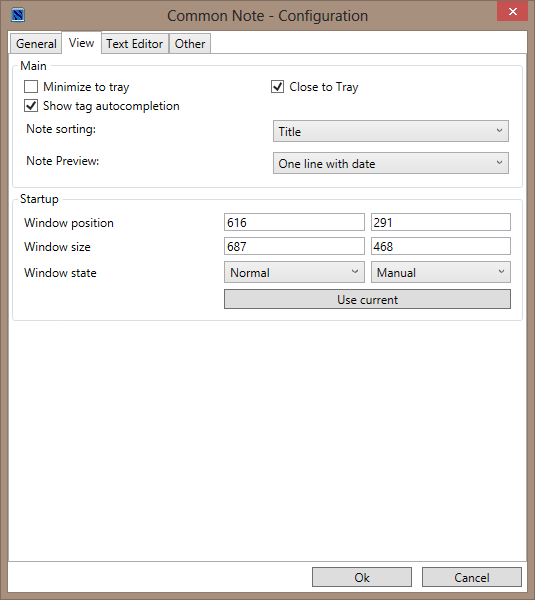 To enable this view, go into Edit - Settings - View, Note Preview: Multiple Lines with Preview. I added AlephNote to the database. Voted! Thanks for doing that. Your issues ( #7, #38, #39) should be resolved. I was a little worried with the latest release of the program as I've got it working just how I want and didn't want to mess about with an auto-update that might break something. So I made a backup of the old program and then was pleased to see it was just a matter of overwriting all the files with those from the latest release ZIP file. Worked beautifully. I'm very impressed with the AlephNote dev. Fixed some issues very quickly.